All steel parts are powder-coated to lock corrosion out. Includes all hardware needed for installation. When you want the look of 33" tall tires without the hassle of an expensive lift kit, take a look at Full Throttle Suspension's Leveling Kits. It's the fastest, safest and easiest way to get the clearance your truck needs. Best yet, a Full Throttle Suspension Leveling Suspension can be installed at home with moderate mechanical ability and a couple hours time. And, Full Throttle Suspension stands behind your Leveling Kit with a Lifetime Warranty. The Full Throttle Suspension Leveling Kit sets your rig level fast and easy for less money. All steel parts are powder-coated to lock corrosion out ﾕ Includes all hardware needed for installation. Shock brackets to utilize factory shocks included. When you want the look of 33" tall tires without the hassle of an expensive lift kit, take a look at LEVELTECH by Full Throttle Suspension's. 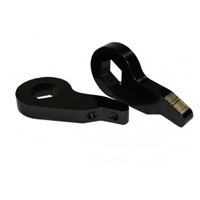 It's the fastest, safest and easiest way to get the extra 2.5" of clearance your truck needs. Full Throttle Suspension brings it level with heavy-duty torsion keys that are indexed to lift without straining stock parts and shock brackets to utilize your factory shocks. 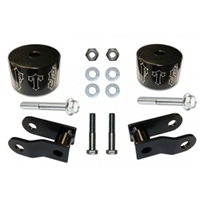 All Full Throttle Suspension Leveling Kit components are created from durable forged steel. LEVELTECH by Full Throttle Suspension can be installed at home with moderate mechanical ability and a couple hours of time. Full Throttle Suspension stands behind your Leveling Kit with a Lifetime Warranty. When you want the look of 33" tall tires without the hassle of an expensive lift kit, take a look at Full Throttle Suspension's Leveling Kits. It's the fastest, safest and easiest way to get the extra 2.5" of clearance your truck needs. If your truck employs a torsion bar front suspension, Full Throttle Suspension brings it level with heavy-duty torsion keys that are indexed to lift without straining stock parts. If your front suspension is supported by springs, your Full Throttle Suspension Leveling Kit uses custom sturdy steel spacers to level front with rear. 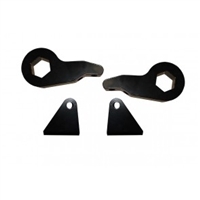 All Full Throttle Suspension Leveling Kit components are created from durable steel. That means a Full Throttle Suspension won't sag or wear out like a urethane leveling kit, and it will last just as long as a professional lift. Custom-fit for your specific year, make and model truck.